For more information about building or remodeling and to schedule a free initial office consultation, Contact Us. On a peak overlooking Johns River Gorge sits one of the most prominent historic seasonal homes in Blowing Rock still in private hands. Joseph and Annie Ludlow Cannon built this magnificent home in 1927 and named it Miramichi, meaning "happy retreat." Joseph was the son of J.W. Cannon, founder of the Cannon Mills textile industry in North Carolina in the early 1900s. 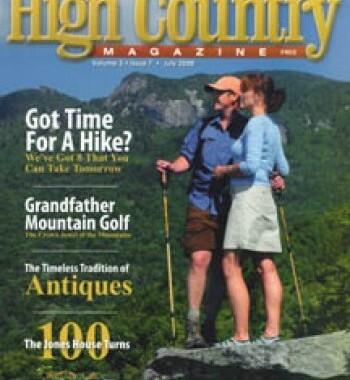 Joe continued his father's work, while his wife Annie was dedicated to improving life in Blowing Rock. She was involved in every civic and moral cause in the community and is fondly remembered as a Sunday school teacher and founder of the Blowing Rock Community Club in the '30s. For years, Annie opened Miramichi every Sunday for evening hymn sings, providing a place for the whole community to have their religious needs met. Although Miramichi continued to be the center of village entertainment and a joyous gathering place for friends and family, trying time were ahead. In 1932, the kidnapping of Charles Lindbergh's baby shocked the world. Wealthy families feared their own children might be the next kidnapping and ransom victims. Among the fearful were Joe and Annie Cannon, whose adopted granddaughter, Ann Cannon Reynolds, was the only living heir to the R.J. Reynolds tobacco fortune and possible the richest child in the country. When the Cannons received a death threat stating, "you're next," they hired Pinkerton agents for protection. The agents lived full time at Miramichi in a detached downstairs bedroom. Ever watchful, they even accompanied the children while visiting playmates. For additional protection, the windows of the house were fitted with iron bars, and a sophisticated locking system was installed. Some of the original window bars are stored in the attic of the home, even now. Miramichi was eventually willed to Mary Ella Cannon, one of Joe and Annie's daughters. She married Ed Morris, president of Bluebell Textiles, the company that later became Wrangler. Joe Morris, grandson of Joe and Annie and son of Mary Ella Cannon and Ed Morris, was their surviving heir. Joe continued to use the house in summers until it became difficult to maintain, and he reluctantly decided to sell the home where he had spent the happiest times of his life. Attorney John Deakle and his wife Gwen, who live in Natchez, had been visiting Blowing Rock for several years to escape the summer heat in Mississippi. When they saw the home, they immediately fell in love with it. When asked what she would change, Gwen said, "Nothing. It's perfect. It just needs some restoring." The Deakles' primary residence in Natchez, built in 1796, belonged to Winthrop Sargent, appointed by John Adams as the first territorial governor of Mississippi, so buying Miramichi was an extension of their love for historic property. After the sale in 2005, the Deakles were impatient to occupy the house. To preserve the history of the village, they insisted on an authentic restoration, rather than a renovation or remodeling, and they wanted it done quickly. To meet this challenge, they hired Boone custom builder Mark Kirkpatrick of Mountain Construction Enterprises. Mark followed strict restoration protocol and said, "Even though the bones were sound, the home sat as a breaker to major storms from the gorge, and the years took their toll." The restoration was major. Joe Morris had done a lot of work on the house over the years, but it still took 20 to 40 of Mark's workers, toiling daily for seven months to restore Miramichi to its original grandeur. All the interior wood and dusty timbers were stripped, refinished, and resealed. Decaying corbels, divided light windows, doors and outside fixtures were rebuilt and copper gutters replaced. Windows were reglazed and old hardware on copper screened doors was sandblasted to its previous shine. Virtually nothing inside or outside of the house was untouched by Mark and his crew. Today, a flagstone circular drive leads to the covered portico entrance of the grand 8,000 square foot mountain-style mansion constructed of Grandfather Mountain stone, poplar bark that replaced the original chestnut bark, green cedar shakes and trim painted in a color called "million dollar red." Mark noted, "The house was designed by architect William Peeps who, over the years, designed many landmark structures in Charlotte including the Ivey building. It was his genius that created this manifestation of great western architecture; and his eye for perfect symmetrical alignment, which is displayed dramatically in the overhead timber work, is astonishing." The interiors of Miramichi are imposing. A flagstone entry foyer, dominated by a dramatic oil painting of Gwen and her cat Oleander, leads to a stone archway framing what was known as the "great hall." Annie Ludlow Cannon's stairway chair lift still rides on steps of hand-hewn chestnut timbers to the floor above. 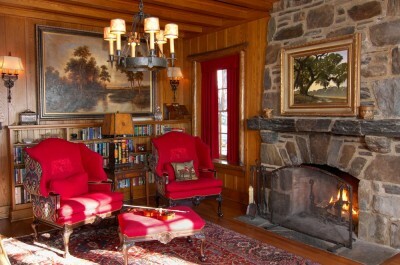 The great hall is a contrast in textures-cold stone walls, warm chestnut paneling and timbers, and rich, soft fabrics. Architecturally, it reflects the western lodge style and was inspired by a trip the Cannons made to the Yellowstone Inn in Yellowstone National Park. Serving as silent sentinels, a wild turkey flies over the fireplace, and elk and deer heads with brass plaques inscribed, "Shot by Joe Cannon in Montana," dramatically adorn the room's chestnut paneled walls. An imposing bearskin rug the Deakles purchased in New Orleans stares silently at visitors. The 28-foot walls, 36-foot ceilings and supporting timbers, cleaned of years of dust, wear the old mallet and hewing marks of the builders. Gwen is not a professional decorator, but she created the interiors herself with a deft hand and a keen eye for detail. She skillfully combined traditional mountain-style furnishings with warm, rich, earth-colored hues while retaining an accurate historical perspective. Gwen says, "When I'm here, the feeling I have is so intimate and satisfying that I never want to leave." The Deakles negotiated with owner Joe Morris to purchase some of Miramichi's original furnishings, and these items-lamps, photos, chairs, paintings and oriental rugs-are in nearly every room. The spirit of Annie Cannon, an accomplished equestrian into her 70s, lingers in her riding chaps that hang over the balcony railing and her beaded leather riding jacket that rests on an antique desk. Cannon Mills linens, distinctively monogrammed with a "C," are displayed in some of the bathrooms and are a gentle reminder to revere this space. French doors off the great hall open to an outdoor patio with a stone pond on one side and an expansive flagstone porch with a magnificent view of Grandfather Mountain and Johns River Gorge on the other. Visible from various angles are bountiful gardens reconstructed from Annie Cannon's plantings. There are six bedrooms upstairs in the main house. English antiques acquired during John and Gwen's travels through the U.K. were the inspiration for the formal European look in these rooms, all exquisitely detailed with antique canopied beds, and some original beds, dressed in yards of rich, luxurious fabrics in elegant pastels. Some bedrooms have connecting baths, others private ones, all with the vintage floors and fixtures. As was common in the time when the home was built, at the end of the bathtubs are boxes for ice storage. When a family member became ill and feverish, servants emptied ice that was held in the boxes into the bathwater to keep it cool. At other times, the boxes were used as hampers for dirty towels. Two other detached bedrooms are downstairs and three additional bedrooms and a sitting area are over the detached four-car garage that were once used as servants' quarters and today accommodate extra guests. The home, which originally utilized steam heat that took the chill off the air but provided little heat, was warmed with a stone fireplace in a sitting room and library fireplaces. While the original steam heat remains, the Deakles installed central heat and air conditioning for comfort. There are doors everywhere. Doors to a formal dining room, doors to a formal library that doubles as a media center and multiple doors to the outside. A swinging door opens to a functional kitchen and an area that was once the butler's pantry-and there actually was a butler. While updated with modern appliances, the kitchen retains the original white painted wood cabinetry, metal hardware and built-in, glass-front cupboards. Miramichi is full of interesting details that reveal its unique construction. The upstairs balcony overlooks the great hall below and is surrounded with a scribe-fit timber railing of hand-peeled round logs. The 36-foot high main roof is supported by 14 by 14 hand-hewn, clear chestnut timbers. The original heart pine floors warm the entire house, and the hand-forged door latches and strap hinges still accent the many interior doors of the closed floor plan. Urban legend claims Miramichi is haunted and that old Joe Cannon sat in the great hall in his underwear and shot at ghosts he heard bumping about. The more likely explanation is that when the steam heat rose to the bathroom upstairs, the creaking noise it made sounded like someone walking. Also, when the wind changed direction, doors were known to open and close by themselves. Gwen insists there are no spirits. "It's not haunted now, but someday it will be, because if I ever die and have an opportunity to 'hang around' somewhere, Miramichi is where you'll find me," she said. The Cannons' legacy lives through their philanthropy-in Cannon Memorial Hospital, the Mary Cannon Morris Foundation, Grandfather Home and the E.A. Morris Foundation to name a few. And Miramichi lives on because of John and Gwen Deakles' loving attention to history. As John said, "We have been given the opportunity to be keepers of the property for a while. We want to leave it in better condition than when it came to us and pass it on to future generations. We've tried to create an atmosphere that is restoring to people. A place, where, when you leave, you feel better than when you arrived. A place you look forward to coming back to. The home has a happy heart." Read more about this Historic Home Restoration. Mountain Construction does custom home building in any building style, including conventional new homes, remodeling and restorations, log and timber frame and structural insulated panel homes.